Prior to European settlement, the Cape Fear Native Americans, of the Siouan language group, lived in and around the lower Cape Fear peninsula; farming, fishing and hunting. Artifacts of the native culture, including pottery fragments, arrowheads and mounds of oyster shells, or midden piles, have been found in this area. Early attempts at colonization in the area were unsuccessful, mainly due to conflicts with the Cape Fear Native Americans. Priating, common in the area during colonial times, also contributed to the struggles of early settlers. About 1730, further upstream along the Cape Fear River from Fort Fisher, the port of Wilmington was settled. Wilmington became a bustling port, particularly important for its exports of naval stores - tar, pitch and turpentine products derived from the resin of the longleaf pine. During the Civil War, Fort Fisher, built in 1861, served to protect the valuable port of Wilmington from Union forces. By late 1864 , it was the last southern port open to trade. In this same year the first of two Union attacks on Fort Fisher took place. The fort held strong during the first battle and Union forces withdrew, but the Confederacy was not so lucky the second time. In early 1865, a fleet of 56 ships bombarded the fort prior to a land assault by a force of more than 3,300 infantry. After a six-hour battle, Fort Fisher was captured and the Confederate supply line was broken. It was the largest land-sea battle fought in any war up to that time. The outcome contributed significantly to the outcome of the Civil War. Approximately three months after the fall of Fort Fisher, the Civil War came to an end. In the late 19th century, a long rock jetty called "The Rocks" was built west of Fort Fisher to aid navigation by stopping shoaling in the Cape Fear River. Completed in 1881, The Rocks closed the former New Inlet, once used by Confederate blockade-runners to avoid the U.S. Navy, and created a lagoon, now called "The Basin". 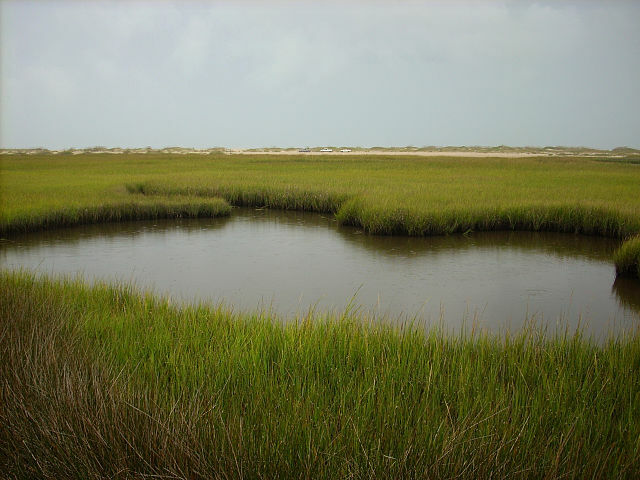 Today, The Rocks and The Basin are part of the Zeke's Island component of the North Carolina National Estuarine Research Reserve, and 1160-acre area of outstanding estuarine and ocean resources with extensive marshes and tidal flats. The southern tip of New Hanover County became an island (now known as Pleasure Island) in 1929 when the U.S. Army Corps of Engineers dreged Snow's Cut (named for Major William A. Snow, Chief Engineer for the Wilmington District). This cut is a canal that connects the Cape Fear River to Masonboro Sound and is now part of the Intracoastal Waterway. World War II caused huge economic and social changes in the Wilmington area as industrial development and shipyards boomed. Civilian workers and military personnel poured into the area during the war years, causing Wilmington's population to quadruple. In late 1940, construction began on Camp Davis, located about 30 miles north of Wilmington. The base used five remote training sites along North Carolina's southern coast, and Fort Fisher became the primary firing range. The range stayed open until 1944, training many military personnel and aiding the war effort. A bunker still remains along the Basin Trail from the World War II base. From 1955 to 1972, Robert E. Harrill, who became known as the Fort Fisher Hermit lived in the World War II bunker. He became a celebrity and philosopher of sorts, becoming known to the thousands of visitors who came to Fort Fisher during those years. Harrill relied on nature for much of his food, eating oysters, clams and fish as well as what he would grow. Over time, as his popularity and reputation grew, he also benefited from donations left by his many visitors. Fort Fisher State Recreation Area was established as a unit of the North Carolina State Park system in 1986 when 287 acres were transferred from the Historic Site to the Division of Parks and Recreation. Today, Fort Fisher offers beach access, educational programming and many other amenities to hundreds of thousands of park visitors annually. North Carolina Division of Parks and Recreation. Fort Fisher State Recreation Area. http://www.ncparks.gov/fort-fisher-state-recreation-area (accessed September 19, 2015). North Carolina Division of Parks and Recreation. Fort Fisher State Recreation Area Brochure.September 2008. North Carolina State Documents Collection, North Carolina Digital Collections. http://digital.ncdcr.gov/cdm/ref/collection/p249901coll22/id/36341 (accessed September 25, 2015). Dincher. "Fort Fisher State Recreation Area Salt Marsh." Photographed. Licensed under CC BY-SA 3.0 via Commons. https://commons.wikimedia.org/wiki/File:Fort_Fisher_State_Recreation_Are... (accessed September 25, 2015). 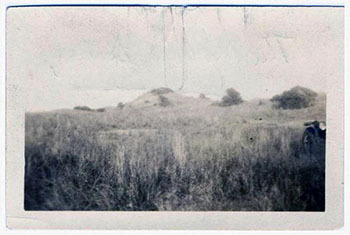 [Mound battery at Fort Fisher]. Photograph. 1917. Item H.1917.35.4, N.C. Museum of History. 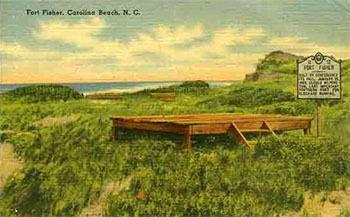 [Postcard, fishing pier at Fort Fisher.] Photograph. 1930. Item H.1950.11.1, N.C. Museum of History.